twofour54 Abu Dhabi has been named ‘Broadcast Services Provider of the Year’ by BroadcastPro at the publication’s annual awards that recognise the best in the business across the region. The judges commended twofour54 for its ongoing initiatives in developing the region’s dynamic and growing media industry as well as twofour54’s world-class production facilities, broadcast services and incredible pool of talent. Judges also praised twofour54’s ongoing contribution to the media industry, such as its backlot at KIZAD, which has been used for numerous film and TV productions, including ‘Al Asouf’, ‘Tiger Zinda Hai’ and ‘Bharat’, which wrapped last month. Other major productions to have filmed in Abu Dhabi this year include Paramount Pictures’ ‘Mission Impossible – Fallout’, which saw Hollywood legend Tom Cruise leap from 20,000ft in the Emirate’s sky for the daredevil HALO parachute jump; ‘Saaho’, starring pan-India icon Prabhas; and Bollywood blockbuster ‘Race 3’ starring Salman Khan and Anil Kapoor, and more recently, Netflix’s ‘6 Underground’ starring Ryan Reynolds and directed by Michael Bay. H.E. Maryam Eid AlMheiri, CEO of Media Zone Authority – Abu Dhabi and twofour54, said: “At twofour54, we not only focus on supporting the creation of quality content but also on ensuring our partners have the means to share it with millions of people around the world, which is why having end-to-end support and world-class infrastructure is so important. “The last 12 months have been incredible for twofour54 with many international and regional studios and production companies realising their creative visions in Abu Dhabi. Filmmakers and broadcasters from Hollywood, Bollywood and the Arab World recognise the world-class, facilities, services and support our thriving media sector can offer. 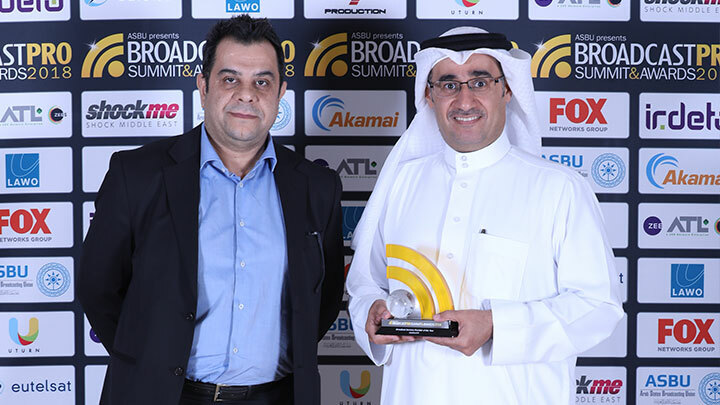 The BroadcastPro Summit & Awards celebrates and promotes excellence in the broadcast and satellite industry across the Middle East and North Africa (MENA). The ASBU BroadcastPro Television Awards covers a broad range of categories across various aspects of the field, from workflow, production and post production to traditional broadcast and new media platforms. The BroadcastPro Awards, which took place at the Habtoor Grand Hotel in Dubai last night, have consistently recognised twofour54 as a leader in the media industry, including awarding the media zone the prestigious Editor’s Choice Award in 2017.